Holi is the most colourful festival of India. During this exciting and exuberant festival, Indians welcome the arrival of spring by gulal (powder colour) showers and water gun shots on near ones, relatives and strangers alike. Rajasthan epitomizes the true meaning of colours in every sense. Right from the people to their lifestyle, from the culture to the celebrations; everything here is larger than life and colourful. Even the cities here are renowned with their strong colourful connect. If we connect the vibrant nature of Rajasthan with the festival of colours, Holi; then the real sense of colourful India can be experienced. Udaipur Holi Holiday embraces the true spirit of colourful holidays in India and offers a traveller a rich experience of Holi in arguably the most luxurious city of India, Udaipur. Celebrations of the seasoned festival are done in a royal way at the iconic City Palace. Even the journey explores the colourful spirit of Rajasthan with a visit to Jaipur (Pink City), Jodhpur (Blue City), and Agra (the city wrapped in the colours of love.) Truly, the most colourful and luxurious way to enjoy the spirit of Holi in India. Delhi is the capital of India and enjoys special leverage over the whole country. Also, it has been the center of interest and is one of the oldest cities in India. As a result, Delhi is filled with a lot of heritage attractions and monuments. Delhi tour in a day allows tourists to experience the old world charm of Delhi with its high-rise modern attractions. After breakfast, begin the Delhi sightseeing tour with a visit to Old Delhi. First attraction in the city is the world heritage site of Red Fort. Built by Mughal Emperor Shah Jahan, this fortress is an iconic tourist attraction in the city. Next to the magnificent monument is the visit to the large Asian mosque, Jama Masjid. The mosque at max can accommodate 80,000 persons during prayers. Further, tourists pay respects to the father of the nation, Mahatma Gandhi at his cremation memorial, Raj Ghat. Next, visit another world heritage sites in the city, namely Qutub Minar and Humayun Tomb. Post lunch, begin a tour through New Delhi which celebrates the discovery of the city’s modern marvels. The iconic heritage of India Gate follows the modern spirit of Delhi. Later, tourists take in the privilege of driving past the Parliament House and India’s President’s Palace. Return to the hotel with a variety of experiences in Delhi for dinner and overnight stay. After breakfast; in time transfer to the Domestic Airport and board the flight for Udaipur. Upon arrival, transfer to the hotel for overnight stay. Udaipur is the most luxurious city in India. Overlooked by the wooded ridges of the Aravalli Hills, the city of palaces and lakes present its exotic best to the traveller. The mirror calm lakes, serene palaces and lavish merchant mansions define its best-kept heritage and make it an ultimate and elegant expression of royalty. The city is also known for lavish Holi celebrations. 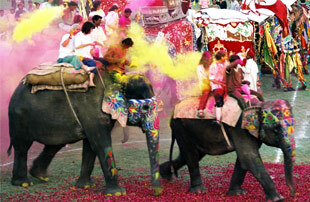 The festival of colours here is celebrated in the grandest of form. Held at the City Palace, Holi celebrations stretch for two days. In the evening - 6.00 pm, we set out for our first Holi function - Holika Dahan within the City Palace premises. Holika Dahan is celebrated with a pious fire lit on the full moon night of Phalguna (one of the 12 months of the Hindu calendar). The ceremony is celebrated to honour the triumph of divine power over demonic strength. The special Holika Dahan ceremony is celebrated in a royally magnificent way featuring a palace procession where royals in their tradition livery and finery host the lively festival celebrations. The royal entourage with elegantly bedecked horses and royal band leads the procession through the Palace from the Shambhu Niwas Palace to Manek Chowk. The Maharana Salute on Shriji's arrival at North of Hathi Baithak, Mardana Mahal, The Manek Chowk by the Guard of Honour takes the celebrations to the next level. As the dusk approaches, the religious ceremonies begin and tourists can look forward to the lighting of a traditional sacred fire where an effigy of the fraudulent Holika is burnt. Local folks perform Gair, a traditional dance specially performance to pull tourists on to this spectacular celebrations. Blessings from Sadhus at the Hathnal ka Darikhana give a new spiritual dimension to the festivities. This will be followed by the royal refreshments and leisure time within one of the palaces. The splendid royal way to celebrate Holi is fulfilled on the third day in Udaipur. Bask in the glory of the exclusive reception you experienced throughout the time in the palace and return to the hotel for overnight stay. The next day in Udaipur is full of colours. Because it’s Holi, you can step out in the city in your old dress to experience the riot of colours and water splashes. 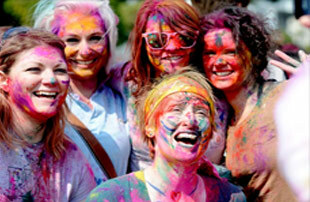 A walk through the alleys and streets in the city can allow you to have a firsthand experience of Holi. (Apply oil on your skin to prevent any allergies.) But if you are not of adventurous kind and want to stay in the hotel only, there are special holi celebrations in the hotel itself. Slightly toned down, the festivities still display the exuberance, fun and excitement of this festival. Evening is free to stroll around the markets of Udaipur. Overnight in Hotel. After the celebrations of Holi are over, begin the enriching sightseeing of Udaipur. Begin the visit to the majestic City Palace. Here, you can enrich your knowledge about the Sisodia rulers and their inclination towards architecture. Within the complex, you can also visit the museum, Jagdish Temple and an elegant garden of queens, Sahelion Ki Bari. Spend the afternoon at your leisure, either in shopping or roaming about in the colorful bazaars of the city or to relax within the luxury of your room and refresh yourself for the latter half of the trip. Cruise through the placid waters of Lake Pichola at sunset and visit the Jag Mandir Palace is another iconic highlight of Udaipur. Check out Jodhpur and drive to Jaipur the pink city via drive. Jaipur presents the elegant expression of royalty through its refined forts, rich palaces and a colourful bustling culture. Upon arrival, check in the hotel for overnight stay. After breakfast, begin Jaipur’s sightseeing with an excursion to the Amber Fort. One of the six hill top forts - UNESCO recognized world heritage site, Amber Fort is the prized jewel of Jaipur. Made of yellow and pink sandstone and white marble, Amber complex is divided in four sections, each within its own courtyard stands unique with novel inlay techniques, etc. Next visit the City Palace, the house of the former royal family; the Jantar Mantar, the royal observatory and Hawa Mahal, the palace of winds. After sightseeing, check out Jaipur and Drive towards Agra, the city of love. 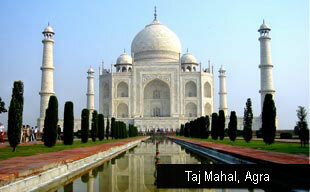 Upon arrival, check in Agra for overnight stay. Early morning wake up to witness the early morning views of the majestic Taj Mahal, the scintillating wonder of the world and a prized architectural jewel for the millions. This marble monument is often seen as an icon of India and presents the grandeur and brilliance of Mughal architecture. Return to the hotel for breakfast and begin the Agra city sightseeing, visit the world heritage site of Agra Fort, Sikandra, and Tomb of Itmad Ud Daulah. Return to the hotel for overnight stay. Check out Agra for a drive to Delhi. Upon reaching here, in time transfer to the International Airport to take a flight for onward destination.